Powder and Bulk Packaging accounts deal with volumes of dust and material that is not found normally in other applications. Tomcat sweepers have a unique "baghouse" filter, which has many times the capacity of a paper panel filter. Another advantage for our battery sweeper customers is the filters often last for years, saving thousands of dollars on replacement parts. 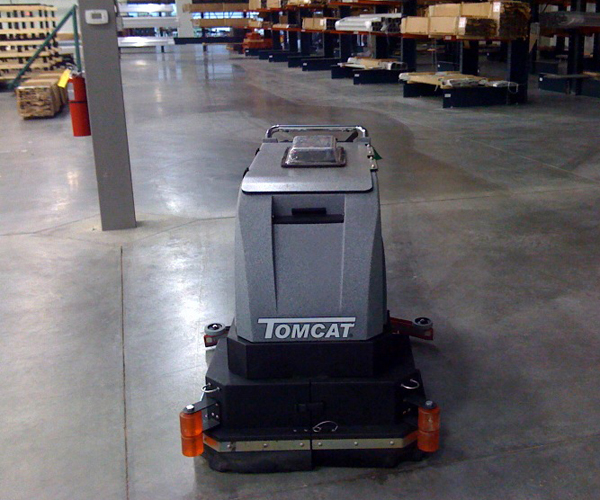 Tomcat sweepers on a daily basis are sweeping in plants that package cement, fertilizer, copier toner, paint pigments, baking soda and other fine materials. The sweepers' all steel body is powder painted to resist corrosion from harsh materials like rock salt or fertilizer, and tough enough to withstand the use in a rough application. The motors and charger on the walk behind and rider sweepers are totally sealed, so dust and dirt from the environment don't contaminant the internals.